G’day. This precarious winter weather has got me living like some form of a hermit, sloth hybrid so any sort of motivation to write or take photos has just disappeared. But that’s those Jan blues for you. And I’ve been racking my brain for more posts of the sartorial affair, being a fashion blogger and all that. But we’re at that point in winter now where you’ll find me in the same old basic clothing – a hoodie and jeans because warmth and comfort > fashun. So it seems like a good opportunity to speak on more of the building blocks of my wardrobe. Those everyday, every season, every year pieces that you can always rely on. The old faithfuls, if you will. But in simpler terms: basics. For me, that’s pretty much the entirety of my wardrobe. Just skim through my blog or Instagram and you’ll see a muster of neutral, basic items. Minimalist, lazy, call it what you like. It’s just what I like (we aren’t going to call it personal style because what even is that?). And if you’re building your wearable, capsule wardrobe or just like your options, we all need a good selection of basics. So, without further ado, I give you the basics. Ah, the oversized knitted jumper. The fool proof, chunky warm hug we can take where ever we go. Pop it over the other 5 layers you’ve got going on in some hope you’ll get to work with keeping the feeling in your fingers. Chuck it on for a lowkey coffee date. Dress up, dress down. You can’t go wrong. Of course, if you’re not one for an oversized fit. Just a good knitted jumper works all the same. Personally, I love how oversized can be baggy for a casual ~vibe~ or tucked in to be a little more put together. That, and being a bit of a shortie, most jumpers are oversized on me anyway. My Bershka knitted jumper (sadly sold out crying emoji) is my go-to, I have in black and white to cover all grounds. However for the sake of this being about basics, go with black. You can always rely on ASOS for some good, affordable knits, this & Other Stories jumper is also pretty beaut if you’re looking for something high quality. We all know I’m not really a skirt gal. But I do think it’s a staple in everyone’s wardrobe. Since adding a denim skirt to my collection, I’ve been surprised how much I’ve reached for it. I can dress it up, down, all throughout the year. In the A/W, pair it with some thick tights and a chunky knit for a comfy everyday outfit. Dress it up with a bodysuit and some heels or boots. And of course, in the summer just add any lightweight top. Definitely don’t underestimate the power of a good denim skirt. I do sometimes sit and wonder if there’s a gal or guy out there without at least one plain white tee sitting in their wardrobe. For real though, I couldn’t count the amount of times I’ve been running late for something and a white top has been there to save my lazy self once again. However, find that perfect white tee can be a bit of a task. You’ve got to find the right fit, comfort to thickness ratio and enough sleeve-age to keep the pits at bay. For ages, I stuck to a classic v neck, and sometimes this number does make an appearance. However, nowadays I’m much more of a crew neck sort of gal. It’s a little bit more versatile if I do say so myself. And I don’t have to constantly adjust to avoid any nip slipping situations. To find your perfect white tee shop around a little, but I would say ASOS and Topshop are definitely your best bets for a good white tee. I wish I could be more experimental with trousers. But I live in jeans. No matter what time of year it is jeans are always on duty. I probably live in black jeans the most, but I’m reaching for a bit of blue jean action more and more at the moment. I’d say even in a capsule wardrobe, you’ve got to at least have one back pair and one blue. I have no sort of fashion police badge to tell you what sort of style to buy. But personally, I keep a pair of skinny jeans and mom style jeans for the ultimate versatility. Now, I can only advice for my petite gals out there but Topshop and ASOS tend to be my reliable one stop shops. We’re going back to that ~layering~ word. I love a bit of layering and a trusty cardigan does the trick all year around. I also think it just adds a little something. So if you are chucking on a white tee and some jeans for your brunch date, add a cardigan and you’ve got yourself somethings that’s just a little more put together. But oh, so comfy. I bought one from Primark for around £13 and I live in it at the moment, but of course our trusty friend ASOS has plenty of choice as well. From about September through until April, my black ankle boots are basically uniform for me. And, if I can, I’ll find an excuse to wear them in the summer. So long as its a pointed toe (personal choice I guess), mid heel at most and they don’t make me want to cut my feet off from the ankles when I get half way through the day – then is a yes from me. So whether you’ve got that 10am meeting, a dinner date or just a roam around the highstreet, chuck a good pair of comfy boots and off you trot. Saying this, my everyday black boots I’ve had for about 3 years have just broke on me, rip. You treated me well my friend. I didn’t know whether to put this as a basic. But when I think about it I’ve worn a hoodie 4/7 days this week. So I definitely think it deserves a place in this post. Because, in reality, we spend a lot of our time in some sort of lounge-wear, and also because you can still make it into an outfit for a street style esque look. You can buy hoodies everywhere, I tend to shop in the mens section as they are cheaper, comfier and aren’t fitted (or if you’re me, just steal your boyfriends). Pop it with some jeans, a coat or jacket and a beanie and it makes for a fab day-to-day outfit. And makes my fellow lazy gals look a little less lazy. And with these 7 pieces, forms the base of my wardrobe. My day-to-day, simple style for almost every situation, and, sure, I’ll branch out and jazz things up with accessories or maybe I’ll even reach for some silver boots every now and again. But if I had to embody my wardrobe up in 7 things, it’d be these. I am still searching for the perfect pair of jeans, I think they are a staple! This post is exactly the kind of post I’ve been looking for. I’m in the process of rebuilding my wardrobe after doing a massive clearout last summer for charity and for Depop/eBay. I’m trying to invest in more timeless neutrals rather than buying anything and everything I see on Instagram – less is more! Still searching for that perfect pair of jeans though. This is such a helpful post and I love the imagery! I am complete opposite of you, I really don’t like to wear jeans, I prefer trousers. I wish I could be more of a trouser person! These photos give off serious scandi vibes- I love them. An oversized knit is so essential, I love my camel toned knit from Mango, I never take it off so cost for wear is definitely low. I’m definitely into a trusty black boot but more of the chunky type, my vagabond dion boots are perfect. Ahh thank you! I live in my oversized knits too you definitely get your moneys worth haha. I do like chunky boots but I just don’t suit them, maybe one day I’ll experiment with them more! I was literally nodding in agreement throughout this post. Every single piece is an essential for me! Though 2 things I would have added would be a leather jacket and a pair of all white trainers. They have saved me SO many times and just go with everything! Absolutely love your photography as well by the way! 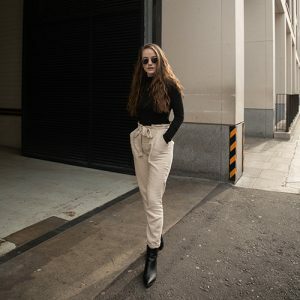 Whenever I’m struggling for an outfit, I always whack out my mid-wash mom jeans and a white tee – its just the ultimate go to! You’re like me when it comes to Jumper and denim skirt. Do I wear those two items in rotation everyday?? Hell ye? I have so many of them my mum has put an official ban on them she’s tired of me ordering more . Yesss I’m exactly the same sometimes I’m scared people think I have a wardrobe like a cartoon character where it’s the exact same outfit hundreds of times haha! Loved this post and I love the street style shots!! I totally understand you with the jeans and hoodie! I’ve been living in jeans and jumpers with boots or trainers! The comfiest outfit throughout the cold days that’s for sure! Okay first of all, loving the photos! Second of all, I’m really trying to work on this, I’ve got the good ole pair of jeans down, which I love swapping out jumpers with. I think I need a blazer to go with my white tee or maybe a good knit jumper next. Love all these suggestions! My perfect pair of jeans ripped this weekend & are no longer wearable 😭 Loving the pictures! Black ankle boots are also a staple in my wardrobe! Your photos are stunning! Nothing beats a solid pair of jeans and a white tee! I defo need to add more basics in my wardrobe! Me, it’s me you’re looking for. I don’t own a single white piece of clothing. Great post and this is so true. right now, in winter time, I basically live in knitted sweaters and jeans. Casual wear i mix them with my winterboots. If I’m dressing up I can pair it with a few pieces of jewellery and a nice pair of shoes (depending on how much it rains of course) it’s so versatile. Loved this! I’m the same, black boots and comfy jumpers are a must for me in winter! Really loving this kind of coat at the moment!